John "Buz" Sawyer was initially a fighter pilot for the U.S. Navy in the Pacific Theatre of World War II. A chivalrous adventurer, he became a trouble shooter for an oil company when the war ended but rejoined the Navy in the 1950’s. 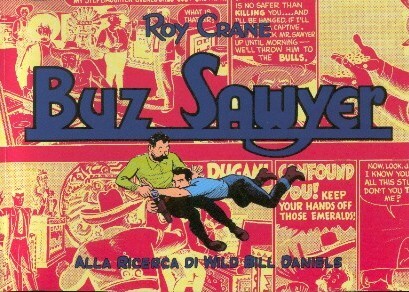 Roy Crane was one of the innovators of the adventure comic strip. Wash Tubbs began in 1924 as a humorous story about the romantic adventures of Washington Tubbs, but increasingly Tubbs became involved in exciting adventures in exotic places. With the creation of the popular soldier of fortune Captain Easy in 1929, the strip became, along with Tarzan of the Apes and Buck Rogers, one of the first adventure strips, . However Crane was an employee of the Newspaper Enterprise Association syndicate, which owned the rights to the Tubbs and Easy characters. Crane approached the King Features Syndicate with an idea for a new strip, and when they offered him ownership he abandoned the Wash Tubbs strips in 1943. Roscoe Sweeney, Buz’ comic-relief sidekick, largely disappeared from the dailies after the war, becoming the star of the Buz Sawyer Sunday strip, a comedy about rural and suburban life. Beginning in the late 1940s Crane turned the writing and drawing chores for that strip over to cartoonist Clark Haas and later Al Wenzel. Eventually, Crane turned most of the writing and drawing of the daily strip over to assistants Ed Granberry and Hank Schlensker, who began signing it after Crane’s death in 1977. They retired a decade later turning the strip over John Celardo, who handled it until it was discontinued in 1989.